Be the first to share your favorite memory, photo or story of Esther . This memorial page is dedicated for family, friends and future generations to celebrate the life of their loved one. 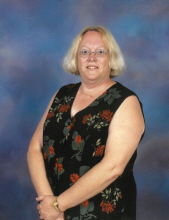 Esther A. Palmer age 62 of Hartford, Wisconsin passed away Thursday, August 23, 2018 at the University Wisconsin Hospital in Madison, WI after a brief illness. Esther was born on May 26, 1956 to Shirley A. (nee Nelson) and Robert W. Palmer. She was an ER nurse for 28 years at Oconomowoc Memorial Hospital and previously worked at St. Joseph’s Hospital in Milwaukee. She proudly served the City of Hartford Board of Review for many years. Esther loved gardening, traveling, and going on various cruises with her friend Mary. Esther is survived by her loving siblings, David (Ann) Palmer of Hubertus, Lynnell (Dennis) Hegy of Hartford, Kenneth (Lyn) Palmer of Slinger, and Patricia Schalliol of West Bend. She is further survived by many loved nieces, nephews, other relatives and friends. Funeral Services for Esther will be held Tuesday, August 28, 2018 at 7:00p.m. at the Shimon Funeral Home (824 Union Street Hartford, WI 53027). Family will greet relatives and friends at the funeral home on Tuesday from 4:00-7:00p.m. Private inurnment in Pleasant Hill Cemetery, Hartford. To send flowers or a remembrance gift to the family of Esther A. Palmer, please visit our Tribute Store. "Email Address" would like to share the life celebration of Esther A. Palmer. Click on the "link" to go to share a favorite memory or leave a condolence message for the family.